Development in Sunset Park has had some bizarre results lately. While rising commercial rents have left dusty gaps, some for over a year, on 5th Avenue, 7th Avenue, and 8th Avenue; new development has been cropping up all over those same thoroughfares. However, next to the latest trend of building up with no regard for what the current or surrounding buildings look like, the "art deco" condos look super-classy. This addition of third and fourth floors to a two story building is confusing. I expected a brick facade to go up relatively soon after construction was complete, but it's been a while and nothing. I mean, the two-toned third and fourth levels are pretty normal, if still unattractive, but to have the grey underneath remain? Perhaps the work has continued to stall due to disorganization, or perhaps it's a comment on the economy. I don't know. On 8th Avenue and 42nd Street, a huge corner "cover-up-the-work" board went up around the southern building. 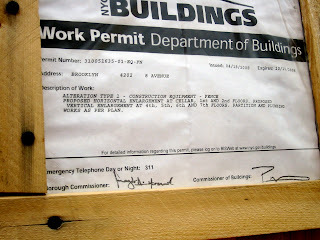 Here's what the work permit says: "Proposed horizontal enlargement at cellar, 1st and 2nd floors. Proposed vertical enlargement at 4th, 5th, 6th, and 7th floors." Wow. Turning a two-s tory building into a seven-story building. I wonder if they will follow the aesthetic of the 7th Avenue building also pictured? Another option is demolition. 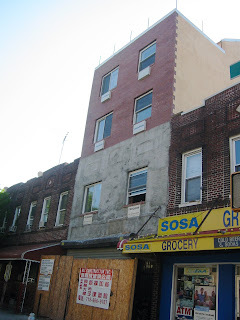 This was also recently highlighted, to the chagrin of brownstone lovers everywhere, in the choice to tear down a brownstone building on 6th Avenue and 54th Street in favor of a style yet to be seen. Cititour has a comprehensive reaction, including photos, to the destruction. It's the fourth post down on the page. Except for the blue tarp, the building still looks like a giant brick eight with a set of stairs. When I used to walk down to 8th Avenue on 43rd Street from the park, I had always paused and admired the new tags from gangland on the two almost-corner houses that sold months and months (could it be over a year?) ago. First the doors and then the lower levels were tagged. Later, the windows were broken, and then the inside walls were decorated with colorful drawings. Finally, it seemed that even the vandals got bored of waiting for someone to respond to their activities. The buildings stood, seemingly ignored, for a long time. The last time I strolled past that corner, I was shocked to discover that the two marked buildings had disappeared! They are gone. Both of them. Demolition, in this case, seemed the most prudent choice. When I peeked through the "cover-up-the-work" board, I was shocked to see just dirt. No evidence of basements or foundations or plumbing or construction materials. It looked really clean, actually. I can't wait to see what happens there. Does anyone want to bet that it will be a brick and silver-barred condominium building? Its proximity to the park makes it prime, I'd think.